A BB leader with over 50 years’ experience was a winner at YouthLink Scotland’s Youth Worker of the Year awards. 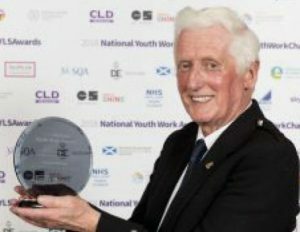 Alistair Whitelaw, who has been with the 1st Lenzie Company since 1965, was awarded the Lifetime Achievement award for his work with young people. Throughout his involvement with the organisation, Alistair has led many young people to successfully complete their Duke of Edinburgh (DofE) awards, for which he was recognised for in 2016 with a DofE Lifetime Achievement honour on behalf of HRH Prince Edward. Alistair has been responsible for countless events and activities, not least the annual BB Christmas card delivery in Lenzie, which in the last three years alone, has raised over £2,000 for charities in Glasgow. Alistair, who is 77 and still very much active with the Company, said “When the news came through about the Lifetime Achievement award I was speechless. My family and friends are over the moon. The BB is 135 years old, but it matters more than ever nowadays. It’s so important that there are organisations and people around to help young people follow the right path. It’s also so useful for their prospects for work – particularly if they can achieve the Queen’s Badge and Duke of Edinburgh’s awards. I explain to the boys in the Company that having these achievements on your CV really makes a difference and sets you apart. Receiving these awards says a lot about you as a person – your character, your respect and commitment. Being part of The BB really sets you up for life’s opportunities”. Alistair, when he finds time to do things outside of BB, enjoys driving the iconic red coloured City Sightseeing double decker buses in around Glasgow.